Sounds amazing, right? To celebrate the book’s release, I’m writing my own bucket list. Some things I’ve already accomplished. Some I have yet to embark on. And, I think, all say a little bit about me. Travel to other countries. Ones i’ve already conquered: Italy, France, England, Greece. Once I’d like to conquer next: India (to see the country, of course, but also to meet S’s grandparents), Ireland (castles! ), Spain, and Germany. I’d also like to go back and see England’s countryside, as we only went to London (which was awesome), and Sicily (because I only made it to Rome, Florence, Venice, Pisa, Milan, and Capri in Italy). Travel the US. Okay, foreign countries are great, but I’d actually like to see more of the country I live in. Perhaps a cross-country road trip. Or a summer in Maine (yes, i’d rather go somewhere colder than summer here in Florida). Or a trip to a Pacific Northwest, which i’ve never seen. Heck, I’d really just like to see LA. Participate in a murder mystery game where everyone is a character and everyone is a suspect. I just really want to dress up and pretend i’m Ms. Scarlett. Get married/have kids. The married part is done. The have a baby is in the process. I mean, technically she’s a baby, but she’s still inside me, so let’s give this a month and a half before I fully cross it off. Write a book. Boom. Done. Buy a house. Also done. The only thing that would make my house cooler would be having a secret passageway. Perhaps something to work on in the future. Okay, there are probably a lot more things I’d like to do/see/experience, but these are ones i’ve had on my list for a while. Who knows, perhaps i’ll start crossing them off this year? It’s really not that impossible to imagine. 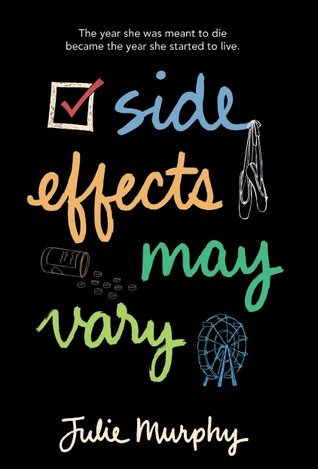 SIDE EFFECTS MAY VARY by Julie Murphy will be released on March 18th. You can buy it online here, here, or here. Find Julie on Tumblr or Twitter.